Your sales kickoff is a big deal. Now that 2015 is over, it’s time to move on to bigger and better things. We’re totally on board. Out with the old, in with the new! But we also know that sales kickoff can be a confusing mixture of excitement and anxiety. We’ve been there. All the feels. To all the sales leaders out there, cheers to an exciting, exhausting, stressful and inspiring sales kickoff in 2016. You’ve spent the year catapulting your sales team to success through sales performance management, coaching and motivation. Woohoo! Now you can celebrate and reflect on all the accomplishments from last year. Key takeaway: Take this time to celebrate your wins. Since you beat last year’s sales goal, you better believe that number is going to increase. We feel you – the anxiety is real. Lucky for you, we compiled the top sales performance reads for 2016 to help you get ahead of the game. Key takeaway: Keep calm and study up. Sales kickoff is the time for important messages, like changes to your product, messaging or sales technology. Since the rise of the sales stack, teams have been adding numerous pieces of technology to put more efficiency into the sales process. Let’s get tech heavy. Key takeaway: As you’re building a sales stack, don’t forget the essentials. Are you including a contest for your team around product lines, sales techniques or even messaging? Channel the force. This is a chance to be a great mentor or coach! Working alongside your team reinforces the idea that you are there to help. Key takeaway: Use the short contest or spiff to get involved with your team. Hopefully, you’re sales kickoff will include some sort of team building experience. Make people play nice. We’re long past the days of the lone wolf salesperson mentality, so it’s important to make sure your team works and learns together. Key takeaway: Encourage team collaboration that will travel with you back to the office. Do your reps (and yourself) a favor, and don’t schedule an 8-hour long keynote speech. Seriously. No one can concentrate for that long. Keep everyone engaged by including breakout sessions for team members to engage in training, coaching or small spiffs. Key takeaway: Switch things up by adding breakout sessions for personal development. Your sales kickoff should include some sort of entertainment option. We’re not talking about spending tons of money to get the Red Hot Chili Peppers to perform for your sales team — just pick something fun for the group to experience together, whether it’s a concert, sporting event, museum tour or something different entirely. Key takeaway: Taking time to do enjoyable things outside of work is one key to not burning out. Sales kickoff is the time to recognize and reward your top performers. Remind people what the reward was and reveal who made it to the President’s Club. Give them lots of high fives. Key takeaway: Make everyone want to be in your President’s Club. Complete your ultimate sales kickoff by adding a little something extra for your reps. Offer a different way for them to get involved with the company, industry or community outside of the workplace. Maybe set up a company bowling team, monthly karaoke night or volunteer group. Key takeaway: Letting your sales reps know you care about them about helps shape a positive company culture. 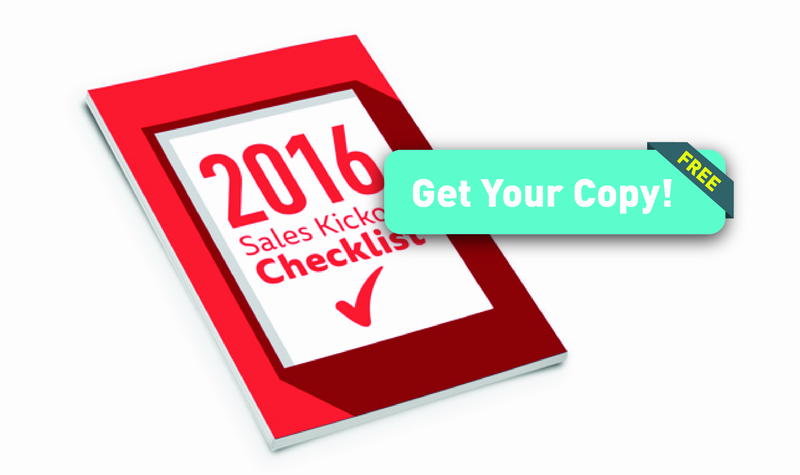 Think you’ve got everything you need to host a killer sales kickoff? Download our easy checklist to find out! Now that 2015 is over, it’s time to move on to bigger and better things. Cheers to an exciting, exhausting, stressful and inspiring sales kickoff in 2016.